I’ve been away for a while due to vacation and Christmas activities. It is good to be back. Today’s topic is seeing the hand of God. Recently, our parish put together something unusual and touching. 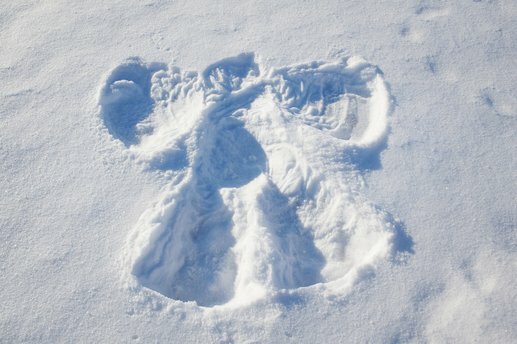 We decided to put together a project called “Andy’s Angels in the Outfield.” An invitation was put out to get participants to line up on a lighted baseball field and to fall backwards into the snow (in zero degree weather) to make snow angels for a recently departed angel named Andy. Our expectations of a few angels showing up were soon overwhelmed as hundreds of angels showed up for the fundraising event to help the family with expenses due to Andy’s illness. Although we raised a nice financial nest egg, we raised the spirits of the family and community. To say that we will never forget, and that love will never die, is part of our faith and our hope. To express that so well on that night will be remembered. It was truly a God-event for many. Tears were shed and hearts were touched. For me, I had the best seat in the house for the event. I was in a tower, high above the ball field. As an organizer, I also knew how things came together. That itself was the hand of God. A six inch snowfall days before made for beautiful angels. The timing of the participants walking in lines across the frozen outfield could not have been better planned. Everyone was in place with 10 seconds to spare. The 8 o’clock bell rang, a shout of one, two, three rang across the tundra, and hundreds of angels fell to the earth to flap their wings in support of a fellow family member and friend. From the tower, it was just like a movie. Hundreds of colorful angels marching across the snowy white field to land for a moment, before flying in unison while looking into the sky. I have to believe Andy looked down and smiled because we looked up and smiled. It is not so hard to believe that heaven and earth can be united. It happened on a snowy field in Ohio. That day, the hand of God looked like snow angel wings. Jesus Came to Divide Us? Is There a Thomas in the House?